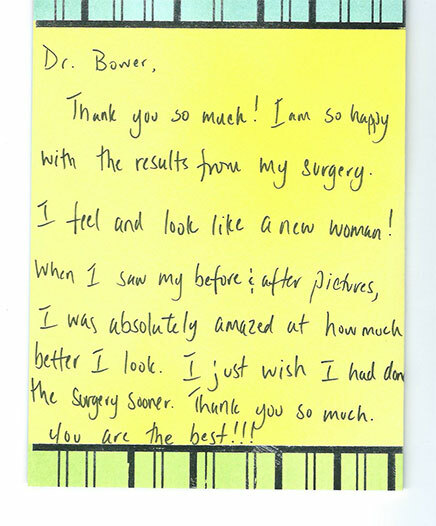 The essential measure of our success is the manner in which our patients view us. 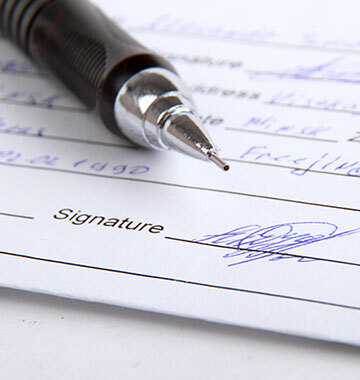 Simply put, our primary goal is a positive experience and a positive outcome for each patient. 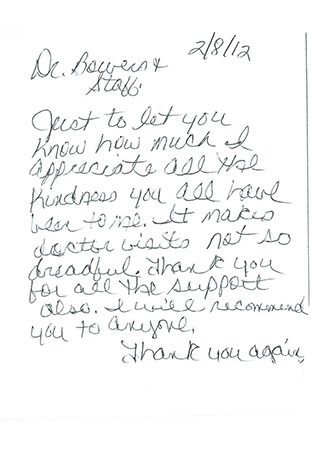 This means that their perception of their experience is the most meaningful aspect of our relationship with our patients. We enjoy hearing from them! I LOVE Dr. Bowers! If he is representative of Cornerstone physicians, my hat's off to you! He is an amazing doctor! I literally view him as part of the team that saved my life. Period. 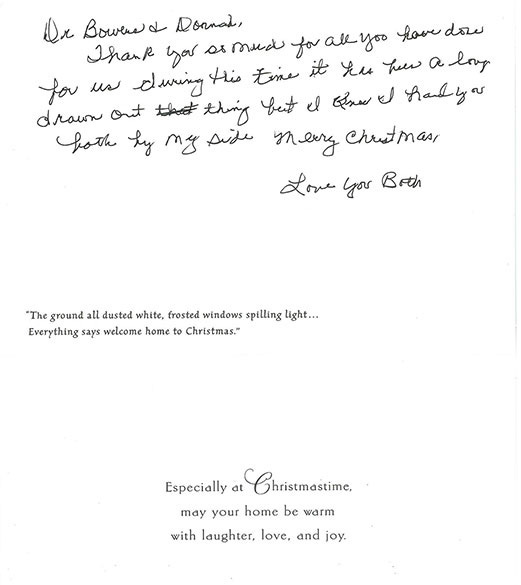 Dr. Bowers and Staff, Just to let you know how much I appreciate all the kindness you all have been to me. It makes doctor visit not so dreadful. Thank you for all the support also, I will recommend you to anyone. 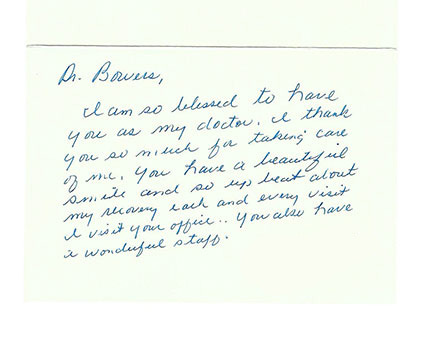 Thank you again, L. A.
Dr. Bowers, I am so blessed to have you as my doctor. I think you so much for taking care of me. You have a beautiful smile and so up beat about my recovery each and every visit I I visit your office. You also have a wonderful staff. 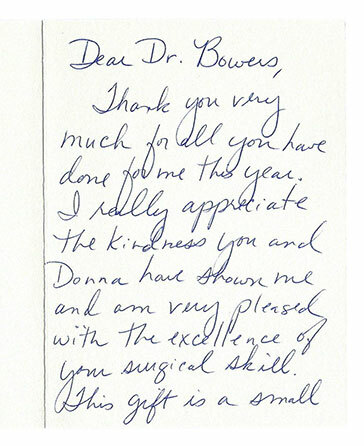 H. B.
Dear Dr. Bowers,It was a pleasure meeting Donna and thank you so much for all your special attention! 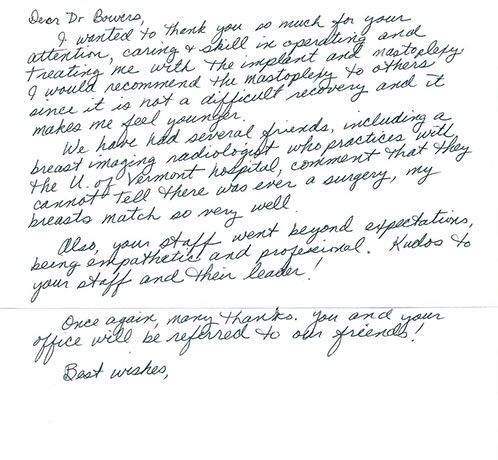 I especially appreciate your reassuring letter before surgery and arranging a post surgery visit. Now- having said that - I have the results and know that i will enjoy my new eyes for years to come. It has been a good experience- please extend my appreciation to the staff and best wishes to you and your family. 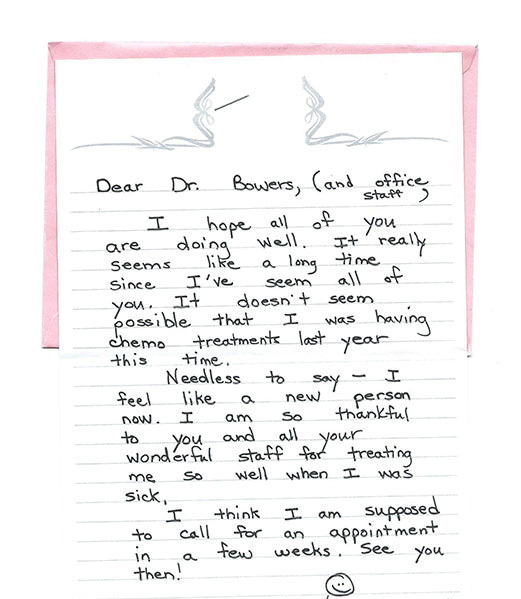 M. H.
Dear Dr. Bowers (and office staff),I hope all of you are doing well. It really seems like a long time since I’ve seen all of you. It doesn’t seem possible that I was having chemo treatments last year this time. Needless to say- I feel like a new person now. I am so thankful to you and all your wonderful staff for treating me so well when I was sick. I think I am supposed to call for an appointment in a few weeks. See you then! H. A.
Dear Dr. Bowers, Thank you very much for all you have done for me this year. 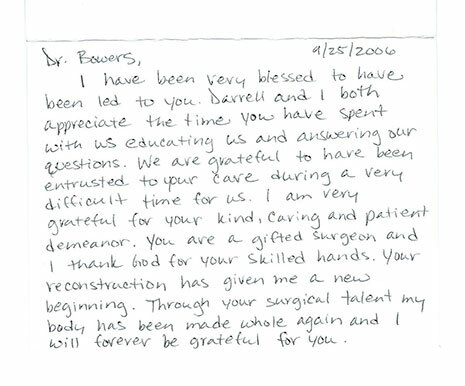 I really appreciate the kindness you and Donna have shown me and am very pleased with the excellence of your surgical skill. This gift is a small. Dr. Bowers, Thank you so much! I am so happy with the results from my surgery. I feel and look like a new women! When I saw my before & after pictures, I was absolutely amazed at how much better I look. I just wish I had done the surgery sooner. Thank you so much, You are the best!! Dear Dr. Bowers,I wanted to thank you so much for your attention, caring and skill in operating and treating me with the implant and mastoplexy. I would recommend the mastoplexy to others since it is not a difficult recovery and it makes me feel younger. We have had several friends, including a breast imaging radiologist who practices with the U of Vermont hospital, comment that they cannot tell there was ever a surgery, my breasts match so very well. Also, your staff went beyond expectations, being empathetic and professional. Kudos to your staff and their leader!Once again, many thanks, You and your office will be referred to our friends! Best wishes, J.O. Dr. Bowers and Donna, Thank you so much for all you have done for us during this time it has been a long drawn out think but I know I had you both by my side. Merry Christmas Love you both, C. and A. W.